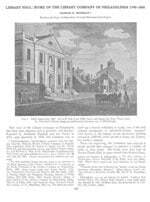 The Library Company of Philadelphia is an independent research library concentrating on American society and culture from the 17th through the 19th centuries. Free and open to the public, the Library Company houses an extensive non-circulating collection of rare books, manuscripts, broadsides, ephemera, prints, photographs, and works of art. Our mission is to foster scholarship in and increase public understanding of American history before 1900 by preserving and interpreting the valuable materials in our care. The Library Company connects with thousands of visitors annually, ensuring that the lessons of the past will continue to amaze, instruct, and inspire future generations. We serve a diverse constituency throughout Philadelphia and the nation, offering comprehensive reader services, an internationally renowned fellowship program, online catalogs, and regular exhibitions and public programs. The Library Company regularly presents exhibits, lectures, symposia, conferences, gallery talks, and other programs in order to make the collections accessible to the widest possible audience. Exhibitions such as “Ben Franklin, Writer and Printer;” “Ardent Spirits: The Origins of the American Temperance Movement;” and “The Hook and the Book: the Emergence of Knitting and Crocheting in American Popular Culture” highlight various strengths of our collection in engaging ways. Program topics range widely; recent events have included a panel discussion on Philadelphia’s food history, casual open houses, the announcement of the 2007 National Book Award finalists, and numerous book release parties. Most events are free and open to the public (although reservations are often requested due to space constraints). For details on upcoming events, please see the Events section of this site. Additionally, many of our Exhibitions are available online. A variety of programs are available to those unable to visit the Library Company in person. Our semi-annual newsletter (The Occasional Miscellany ) and our monthly electronic newsletter educate and inform on topics such as recent acquisitions, exhibitions, publications, and seminars, along with interesting features on our collection’s most remarkable pieces. To receive the most recent Occasional Miscellany or our monthly newsletter, click here. You can also sign up to receive notice of upcoming events and follow us on Twitter and Facebook. 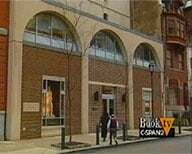 The Library Company is America’s first successful lending library and oldest cultural institution. It was founded in 1731 by Benjamin Franklin as a subscription library supported by its shareholders, as it is to this day. During the early years of the United States, books were not widely available. Standard English reference works were expensive and difficult to find: they had to be shipped to the colonies from Europe, and the average person could not afford to purchase the books that well-rounded intellectuals thought worth reading. In 1731, Benjamin Franklin convinced members of the Junto, his “society of mutual improvement,” to pool their resources and purchase a collection of books none could have afforded individually. 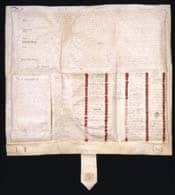 Articles of Agreement were drafted on July 1, 1731, and the Library Company of Philadelphia was established when 50 founding shareholders signed on. Each contributed 40 shillings and agreed to pay ten shillings per year thereafter. As the Library Company’s collection grew, the book capital of each shareholder expanded as well. The collections grew with the nation and reflect the country’s many faces and varied interests. From the Revolutionary War to 1800, when the national government was in Philadelphia, the Library Company also served as the Library of Congress. Until the 1850s it was the largest public library in America. All of the books the Library Company acquired year by year over more than two and a half centuries are still on its shelves, along with many others added since it was transformed into a research library in the 1950s. In the 21st century, the Library Company serves as a resource for a variety of readers, from high school students to senior scholars, from novelists to film producers, and anyone else with an interest in our collections. The Library Company of Philadelphia, Revised and Enlarged 2015. A lively account of the history of America’s oldest cultural institution illustrated in full color with more than one hundred of its most beautiful and important books, graphics, and works of art. The eminent Franklin scholar J. 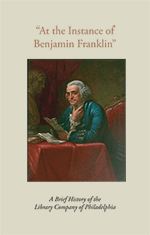 A. Leo Lemay, the H. F. du Pont Winterthur Professor of English at the University of Delaware, published three volumes of his projected seven-volume biography, The Life of Benjamin Franklin, before his death in 2008. The second volume, titled Printer and Publisher, 1730-1747, includes a chapter on the Library Company that is the most comprehensive treatment of its founding by Franklin in 1731 and its subsequent history over the next several decades. Through the courtesy of the University of Pennsylvania Press we are able to offer this chapter available in PDF as well as notes in PDF. A printed catalog of the Library Company’s collection, including artifacts and coins, along with a history of the Library Company, its charter, laws, rules, and members. A printed catalog of the Library Company’s collection with additions to the 1789 printed catalog, including the over 2,500 volume bequest of the Rev. Samuel Preston, and a list of coins and medals in the collection. Also included is a history of the Library Company, its charter, laws, rules, and members. A printed catalog of the Library Company’s collection with additions to the 1807 printed catalog. Also included is a history of the Library Company, its charter, laws, rules, and members. This 1835 edition is called vol. 1 & 2, with vol. 3 published in 1856. The third volume of the printed catalog, of which vol. 1 & 2 was published in 1835, also includes an index to the complete set, as well as a list of portraits in oil in the collection.